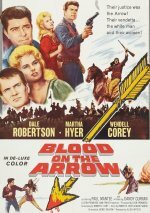 Prisoner of a U. S. Cavalry patrol, outlaw Wade Cooper (Dale Robertson) is the only survivor of an Apache attack. Nancy Mailer (Martha Hyer) rescues Wade and brings him to her husband Clint's (Wendell Corey) trading post, where she nurses the outlaw back to health over the objections of her husband, a cowardly miser. The Apaches raid the post, kidnaping the Mailers' son and demanding rifles in exchange for his release. Clint Mailer obtains the aid of an outlaw band to steal the rifles from an Army post, but they are caught by soldiers and killed. Wade rescues the boy by leading the Indians into a booby trap in Clint's gold mine, and he and Nancy, who have fallen in love, start a new life together.